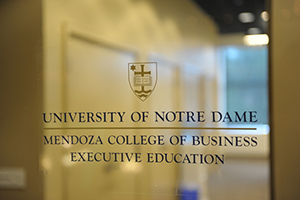 The University of Notre Dame’s Mendoza College of Business expanded its presence in Chicago with a newly renovated space in its Michigan Avenue campus. The expansion will house graduate and executive business programs offered by Mendoza’s Stayer Center for Executive Education, which has provided a Chicago-based Executive MBA since 2002. The program celebrated the opening of the space with a ribbon-cutting ceremony in April. “The new space will be a great asset in helping us meet the increasing demand from working professionals in Chicago and elsewhere for an academically excellent business program based on the ideals of Notre Dame — ethical leadership, a commitment to service and a strong sense of community,” said Jeffrey H. Bergstrand, associate dean of Graduate Programs at the Mendoza College of Business. Students, alumni and college leadership celebrated the opening with a ribbon-cutting ceremony on April 17. The 8,200-square-foot space, located on the third floor of the city’s historic Railway Exchange Building on Michigan Avenue, includes a 48-person high-tech classroom, a hospitality space, six team rooms, four offices and two “hoteling” spaces for visiting faculty and staff. The “lab-style” classroom encourages interaction between students and faculty, with tables and seating arranged to facilitate teamwork and multiple computer monitors and screens so that students can showcase their work to the class. The glass-enclosed study group rooms also have advanced technology, glass white boards throughout and large spaces for multiple teams to congregate. Capital IQ and Bloomberg terminals create real-time learning experiences. A kitchen area provides casual dining and refreshments so that students can focus on their studies without having to leave for meals. The expansion also strengthens the connection to the main Notre Dame campus, noted Bergstrand, since the state-of-the-art technology fully links to the business school, allowing for data and video exchange. The interior design is intended to promote a close affinity with the traditional Notre Dame experience, said Suzanne Waller, director of Stayer Center for Executive Education Degree Programs. Programs conducted in the expansion include Mendoza’s two newest graduate business programs, the master of science in finance (MSF) and the master of science in business analytics (MSBA), both of which launched in January. MSF is a one-year, 35-credit hour degree program for working professionals interested in careers in the finance industry. MSBA is a one-year, 30-credit hour program, also for working professionals, that provides foundational knowledge and skills in big data analytic techniques. The third-floor suite also provides the capacity for teaching the college’s custom program clients, such as Walsh Construction and Tsinghua University’s People’s Bank of China School of Finance. This is the second time that the Mendoza College of Business has expanded its presence in Chicago. In 2009, the college renovated a 9,500-square-foot second-floor space in the building at 224 S. Michigan Ave. and moved the Notre Dame Executive MBA (EMBA) program there from a shared conference center. The comprehensive renovation resulted in a technologically advanced 70-seat tiered classroom, four breakout rooms, an executive dining room, a reception area and a business center. The top-ranked Notre Dame Executive MBA is offered in two formats, including a 17-month program that meets biweekly in a second-floor suite in the Chicago campus, as well as a 21-month program that meets once each month at Notre Dame’s Stayer Center in South Bend, Indiana. VOA Associates is the architect and interior designer of the newly renovated space. For more information about the Stayer Center for Executive Education or the Notre Dame Chicago campus, call 574-631-5285 or email emba.business@nd.edu. Originally published by Carol Elliott at news.nd.edu on May 27, 2015.